A few weekends ago, the girls and I passed a sign for an estate sale in a neighborhood near ours on our way home from a trip to the bank and post office. It's a cute little neighborhood, so I thought it couldn't hurt to check it out. Cars were lining the street, so the girls trudged up the hill with me to the house. As we stepped through the front door of the little brick rambler, we were greeted with a wall of antique toys next to a giant bookcase of glass collectibles. I had a super-fun time "whisper-shouting" at Natalie to stay away from the $50 antique porcelain doll. Whoever the house originally belonged to was quite a collector of glassware, holiday decor items, and books. The little house was brimming with finds, although I felt like many were overpriced. I passed by a few items that I really liked because they were just a bit more than I was willing to pay, but we did bring home a few treasures because everything was marked 25% off. The vintage metal plaid Thermos lunchox will make a really neat addition to my Fall decorations. I put it up in the attic with the Fall tupperware box, and I'm sure it will be a nice surprise when I go to decorate in September. I've seen a lot of those around Blogland, so they must be pretty collectible. The fabric was less than a dollar and has little vintage paperdolls on it. I also found a baggie of wooden spools for $1. Those found a home in an apothecary jar. Not a bad little Saturday morning jaunt, even if I did have to watch Natalie and Michaela Byrd with hawk eyes. The last thing I needed was to spend $60 because my two year old thought it would be a neat idea to play kitchen with the display of crystal goblets. I'm linking to Rhoda's fab Thrifty Treasures party at Southern Hospitality. That must have been fun shopping for treasures! When I think of all of the things my mom threw out 50 years ago because it was "junK'...especially all of my wonderful tin lunch boxes. I got a new one every year based on the latest fad, so I would have had a collection of them all...Howdy Doody, Will Rogers, Lassie, etc. Great finds! I would have bought any of your things in a heartbeat, especially the plaid lunch box. That's going to look so cute or a fall or winter display. Do you have anythign up your sleeve for using the fabric? Very nice finds, Amanda! YAY, you got the linky working. I like having pics. I have only been to a few estate sales myself but both have been a bit pricey and they don't seem to want to haggle. I love the lunchbox and the material. My sister's first lunch box looked exactly like that. Mine was the 1965 Beatles lunchbox! (Which I still have!) Nice finds! I like that fabric, I'm sure you'll find something cute to make out of it. I tried to go to an estate sale last weekend - it was advertised but no one showed up at the house, there was a lot of other people waiting too. This weekend I didn't feel like getting up early Saturday morning ;)- it seems like I get the best things if I hit the garage sales early - before 8am. The fabric is so cute! I am such a sucker for fabric! I like the plaid box too. Great finds. Great finds! I am in LOVES with that plaid lunchbox. It will be the highlight of your fall decor for sure! The fabric looks fun! and that lunch box... I think we had one in the 70's ... just like it!! I am sure of it!! LOL! How cute is that lunch box?! Love it! I'm dying to hit some yard sales this spring but haven't had the time to yet. :-/ Great finds! 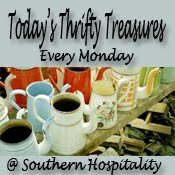 I haven't found ANY thrifty treasures lately. boo. Of course I haven't been looking! I want to see a picture of the apothecary jar with the spools in it! Great finds! I especially love the lunch box.